About a Lost Boy Luke looked into his cornflake bowl and watched the solitary flake sink into the milk. "Do you have to go away again?" He asked his Mother, whilst still watching the bowl. "It's the third time this month. I haven't seen Dad for two months." "Now you know that both Dad and I are very busy people. Dad is in Saudi Arabia and I have to go to L.A. to meet up with Catherine Zeta-Jones to discuss a make-up promotion, so be a good boy and don't moan. I promise I will bring you back something nice." 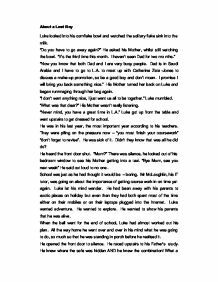 His Mother turned her back on Luke and began rummaging through her bag again. "I don't want anything nice, I just want us all to be together." Luke mumbled. "What was that dear?" His Mother wasn't really listening. 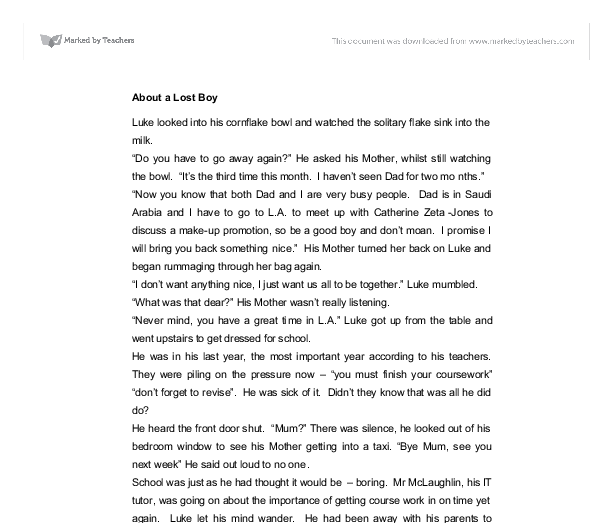 "Never mind, you have a great time in L.A." Luke got up from the table and went upstairs to get dressed for school. He was in his last year, the most important year according to his teachers. They were piling on the pressure now - "you must finish your coursework" "don't forget to revise". He was sick of it. Didn't they know that was all he did do? He heard the front door shut. "Mum?" There was silence, he looked out of his bedroom window to see his Mother getting into a taxi. ...read more. He then boarded the plane. The flight was long but Luke was tired and tried to sleep. A small child was getting grumpy across the gangway and kept Luke awake but finally the Captain announced that they would be landing for refuelling in Singapore. Their stopover would be around three hours and Quantas asked any passengers who are flying on to Sydney to stay within the airport complex. Once refuelled and the passengers reloaded the plane took off again bound for Sydney. Luke looked through the aircraft window and saw sights he had only seen on the TV and in magazines; the Sydney Harbour Bridge, The Opera House and the tall buildings in downtown Sydney. The sun was shining and Luke was excited. Once through customs and out of the airport Luke felt a little awestruck. Just what was he going to do now? He realised he could do anything, he had the cash why not enjoy it. He hailed a taxi "The best hotel in Sydney please" He said to a bemused taxi driver. The next day, after dining on steak and salad the previous night and having the biggest breakfast he had seen, Luke decided that he must make a plan of what he would do now. He sat at the table next to the view over Sydney Harbour and pondered. He could go into the outback and try his and at sheep rearing, no he didn't like animals very much. ...read more. Perhaps you explain yourself." "Mr Gray if you have been lucky enough to receive that kind of money from this company then I cannot ask you to pay it back - as for being your son I am afraid that my parents died when I was a teenager, what little I saw of them mostly away leaving me to fend for myself. Well I have fended for myself over the years and have made a success of my life. I have a beautiful wife and children. I am sorry that you have lost your son, but I lost my parents all those years ago too. Now I am sorry but I do have an important meeting to attend so I wish you good day." Luke walked straight past his parents and out the doors, past Joan and Susy on reception. Down in the elevator and onto the busy New York street without a glance back. He walked and walked until he was in the centre of Central Park. There he found a park bench and sat down. He realised he was shaking. He looked at his watch and reached for his mobile phone. He telephoned the office. Joan answered. "Cancel Mr Takimoto, Joan making my humblest apologies, I am going to spend the rest of the day with my family." "Yes sir." Luke switched off his mobile and went back to the edge of the park, hailed a yellow cab and went home. ...read more. Learn to make better choices today that allow you to leave the legacy you desire. Turn off the noise, turn up the silence and choose to become your highest gift. A better life awaits you! From the Decision Maker's Point of View: Stephen Covey's Habit 2 is "Begin with the end in mind". Angelo stood aloof and enthusiastic while the remaining persons stared in disbelief at this proud and bold character, who for once was breaking out of his cocoon of seriousness. A few days later word reached Deano about the proposed spectacle in front of royalty. Flip was smiling down at me. "He's up" Flip shouted to Worth. "Here drink this" Worth ordered. "What is it?" I asked weakily. My vision was becoming very weak. "Its a antidote. Come on drink up" Worth said. I took the antidote and drank it. I never get a chance to read it. Back at the hotel, Pr�tte is hungry again. She insists on ordering from room service, but they never show up. She wants to stay up waiting, but eventually my parents make me, Pr�tte and Tony go to bed. Finally, when everyone else is asleep, I sneak out of the hotel. But seen as Andy and I were abandoned by our parents when we were little, we had been living in foster homes. I Used to run away from the home often enough but know it had become a bad habit. I then went downstairs to see if there was anyone around. In the ordinary looking kitchen was a women, she was doing the washing. " Hello, do you own this place? ". I said. The women jumped in surprise and started to speak some kind of Egyptian language. A Boy and His Dream !!! was that my father had been drinking and was too drunk too reason with. I should have escaped but froze in a matter of seconds as soon as my colossal father stepped near me, enraged he confronted me looked me straight in the eyes and told me that I knew what was going to happen.